Edmonton City Hall will be the venue Thursday for an art exhibition with a difference. All the musicians and painters are newcomers to Canada and hope to make the kinds of connections that might help them find jobs. Roy Abdalnour hopes to once again feel the thrill of playing his violin in front of an audience. Back home in Syria, the recent refugee made his living sharing the stage with renowned musicians, as a regular performer at the Opera House in Damascus. He'd like to do the same here in Canada, but so far doesn't really know how to make that happen. As a first step, he'll show off his skills Thursday evening at an artists exhibition for newcomers at City Hall. 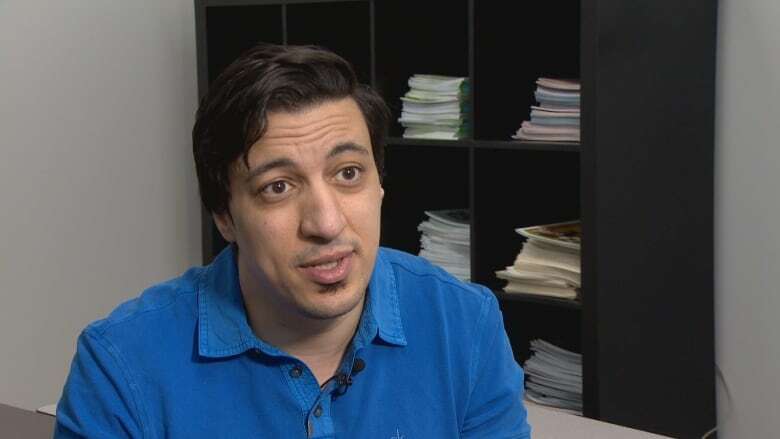 "I have a message in my heart," said Abdalnour, 39, who arrived in Edmonton in December with his wife and two sons. The family fled the city of Homs in 2015 to escape a war that has claimed thousands of lives and created a massive refugee crisis. They first went to Lebanon before being privately sponsored to come to Canada. "In Syria, we don't have any city that is safe," said Abdalnour. His family feels safe now. And while they've only just arrived, Abdalnour is keen to get back to work. He will be part of a lineup of musicians and painters who hope to make connections at Thursday's show. Veniamin Tomsa, 38, will be there for the same reason. He, too, was a professional musician back home in Moldova, playing piano, accordion, trumpet and guitar. But in the three years he has lived here, Tomsa has worked construction jobs to pay the bills. He hopes to find something new at the exhibition that involves his passion for music. "I hope to find somebody and make connections," he said. The Creative Connection Exhibition is being put on by the Bredin Centre for Learning, which helps newcomers settle in Canada. Tarek Fath Elbab, a counsellor at the centre, noticed a number of his clients once had rewarding careers in their chosen fields. One is a classically trained Armenian pianist who currently works as a cleaner in Edmonton. "They have wonderful talents," he said. "But the problem, especially with art, is that it's all about networking. If people don't see your work, they will not be able to recognize you." Fath Elbab spent the past five months arranging this show and sending out invites to everyone he could think of. The first show he put on last year was much smaller but still helped a couple of artists make contacts that led to work. Both Abdalnour and Tomsa also want to share their music and see where it takes them. "I want my heart put in my violin and all my music go to all the people," said Abdalnour. The art exhibition runs from 5 p.m. to 8:30 p.m. Thursday at City Hall.